Who really likes to wander among the hills and valleys, could not find better starting point, than the Lukács Hotel, in Kazincbarcika, which was built five years ago. The most beautiful places in the hills north-east region - including Szilvásvárad Aggtelek, Lillafüred – are easy available. Hotel Lukács*** work as part of an entertainment complex of Kazincbarcika, in the heart of the city. 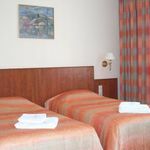 Modern hotel rooms, sixteen double rooms - two of them disabled - and four pieces, suitable for accommodating up to four rooms are available. 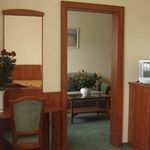 Our rooms are standard equipment include: television, telephone, safe, minibar, air conditioning, internet access. In addition, convenient service for our guests the opportunity to provide all-day room service. Belonging to Hotel Lukács *** , the Beach Restaurant is justly the favorite restaurant of Kazincbarcika, where nearly a hundred different food and wine specialties and excellent service welcome our guests with live music on weekends. Additional services include conference rooms, which are an excellent place for family and corporate events, weddings, gatherings of friends, school, team trainings. Our hotel is perfect for every age group - for children, adults and families alike. The rating of Hotel Lukács Kazincbarcika is 9.4 from the maximum 10, 112 based on actual and valid guest ratings and reviews. "A szállásleírásba mindenhol Márciustól indul a kültéri jakuzzi,ennek ellenére nem működőt.Pedig mi kifejezetten ezért foglaltunk itt.Elég nagy csalódás volt mert találtunk volna olcsóbbat,Wellness részleg nélkül." "A szállodai szobában maradt a telefonunk és nem lett meg..."
"A fürdőszobában zuhanyfüggöny van, nem kádparaván, emiatt poshadt, savanyú szag van bent." Based on the reviews and comments of actual guests, the services of the Hotel Lukács Kazincbarcika have received a high rating of 9.2/10.